Note: If you are only streaming to Stream Monkey (and not also to Facebook Live) check out our easy set up here. Select RTMP Server for a live stream. Change the name of the stream to either HD, or SD High, Low or Medium, depending on the stream you are setting up. You will then want to set up your own encoding presets. Click on the settings button next to the encoding box. Set the Frames Per Second at 30. Set the Key Frame to every 60 frames. Set the profile setting to Main. 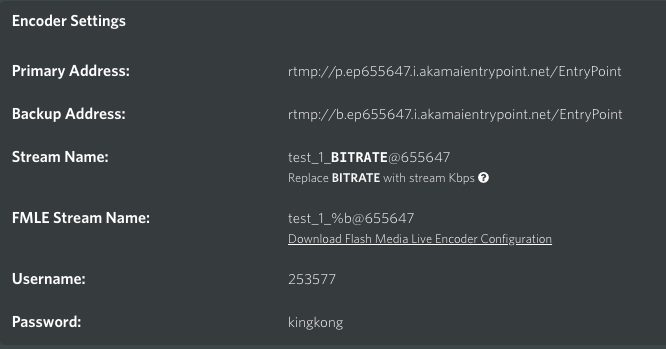 Check Keyframe Aligned, but uncheck Strict Constant Bitrate. Select the Audio Encoding (AAC). Back in the Output settings window, you will select the encoding preset you just created from the menu. The address needs to be the Primary Address from the stream you have set up on the Stream Monkey site. You can find it under Live Streams, then by clicking on the Details button on the stream you would like to use. If you click directly on Primary Address listed, it will copy it to the clipboard for you. Paste the Primary Address into the address box. In the Stream box, you will need to paste the Stream Name from the Stream Monkey Dashboard (see above photo). 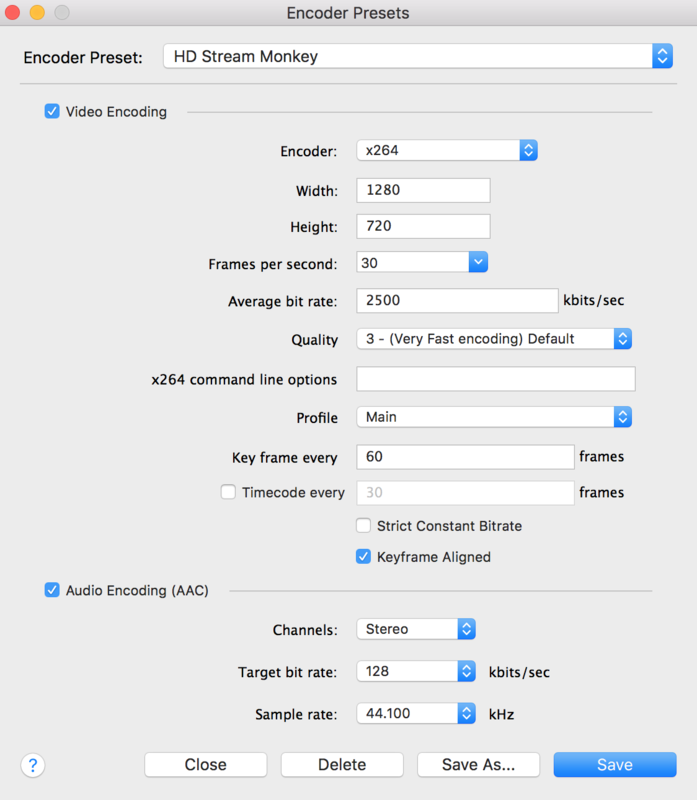 You will replace the word BITRATE with the bitrate number shown in the Wirecast Output Settings box, right below. Change the User Agent to FMLE/3.0. Click on Set Credentials and put in the Username and Password found right below the stream name. Once all that is done, you have one output done! You will want to repeat this process for any size streams you would like to output. You may also want to make backup streams. To do this, when it asks for the address, you would put in the Backup Address from the Stream Monkey site, instead of the Primary Address. Now you will need to set up your Source Settings. To do this, go to Sources in the menu, then Source Settings. Once your video input is set up to your computer, you can hit the plus sign at the bottom and select the correct video and audio inputs. Wirecast lets you work between multiple inputs, like a switcher. You can go down to the timeline and hover to add an input. Click on the plus sign to add a video input, then it will let you select a camera. You will want to click on the settings button to make sure that you select the correct audio input to go with it. After you get everything set up, you will simply use the preview/live screens above to switch between whatever input you would like to use. You can start with a black screen and choose different transitions to move to your video input. Simply hit “Stream” at the top and your stream will go live. You will want to keep an eye on some of the information at the top to make sure that your stream is sending without interruption. In this example, the Stream is green, so you know you are sending a stream. It also shows frame drops and the kbps. These will jump around a little depending on what you are transmitting. The CPU percentage here looks good. If it is in the red, you need to free up some memory on your computer by closing some programs so that it can send smoothly. You can see the connection here is pretty good. If the connection is dropped for some reason, it will show an orange icon. Once your signal is up and running for at least 45 seconds, you can go to the Stream Monkey site and click on “Preview” next to your stream to make sure that the signal is sending and that it everything looks clear. If you'd like, Wirecast also allows you to record directly to a disk. To do this, you would add another output setting, but instead of selecting RTMP settings, you would select Record to Disk MP4 as your output destination. Then simply select your encoding preset and where you would like the file to save. This way, you can Record and Stream at the same time.